I am now in mainland China in a city called Dongguan, and we are shooting images and video here in this industrial city. Last night we were invited, as the guest of honor, to a dinner in the city. This was a very interesting experience; one that I appreciate for the experience, but if never done again, I would be happy. Everything started off like any other nice dinner in China. We were escorted back to a private dining area, which is very common here in China. Funny thing is, the first thing they do when you get into the room is to turn on the TV. I was told that, here in China, everyone has the TV on during dinner. As we walked in to the restaurant, they told me to take out my camera and take pictures. When I saw this area, I knew that this was not an aquarium. But, hey, I am OK with eating fresh fish. No problem. Fish heads, fish heads....jolly jolly fish heads. Remember that song? Then I saw these snakes which are soaked in alcohol. I was told that drinking this alcohol makes you more of a man (if you know what I mean), and they offered me a drink. No thank you! But then, they invited me to come and watch a guy take a poisonous snake out of his cage. I thought "cool - this should make for some fun pictures" and I started shooting. Until...he took the snake over to the chopping block and WHACK! And then he proceeded to drain the blood from the snake into a glass half full with alcohol. I was busy shooting and also grossed out at the same time. They ended bringing this glass to our table at the beginning of dinner, but thankfully nobody drank that, not even the native Chinese. 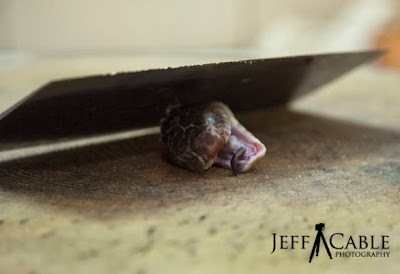 The snakes head continued moving for minutes and the body moved for at least 10 minutes (even after it had been gutted of everything and skin removed. It was a weird site to see. Later on, the cooked snake was brought to our table. It actually looked a lot better this way, but then again, almost anything would look better than a live snake. Heck - anything fried can be eaten right? So...not to be rude, I gave it a try. The funny thing is...there is almost no meat on the snake, so I am not sure why they like this so much. Once again, they say that this is good for your manliness. I was OK with trying the fried snake but there was no way that I was going to try eating the cooked snake skin. No thanks!!! Here is a shout out to my friend Dan for helping me VPN back to the USA to get around all the restrictions here in China. The communist government does not allow access to blogging, FaceBook, YouTube...Thanks Dan! Having traveled the cities in your itinerary myself, your eye for composition and deft lighting technique - especially in backlit subjects - is simply wonderful. Your use of leading and framing lines, selective focus and focus depth frames the story visually, uniquely and interestingly. Lexar should be pleased to have this work included in their advertising, as I believe some of your other images have been previously.